What Does Brexit Mean For The U.S.-U.K. 'Special' Relationship? : Parallels Secretary of State John Kerry reiterated in London on Monday that the U.S. could not find "a better friend and ally" than the U.K. But the relationship is bound to change. 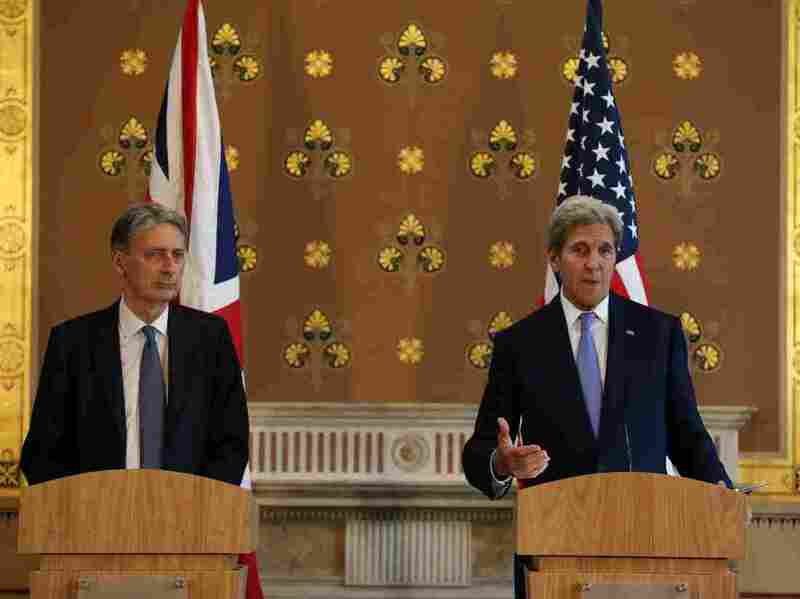 British Foreign Secretary Philip Hammond (left) and U.S. Secretary of State John Kerry hold a joint press conference after meeting in London on Monday. The U.S. "could not ask for a better friend and ally," Kerry said. The long-lasting partnership has meant the White House more often than not relies on Britain to help garner broader European buy-in when it comes to major security, trade or foreign policy issues, such as Russia's actions in Ukraine. But the Brexit decision drives home the cold, hard fact that the U.K. is unlikely to have that kind of clout with the EU again — and the U.S. now needs to rethink its relations with European nations. The upheaval comes at a critical juncture for U.S. and Europe. The White House is trying to hammer out a multibillion-dollar trade deal, the Transatlantic Trade and Investment Partnership, with the EU, the largest single market in the world. The White House looked to Britain to help sell a wary EU on entering this trade bloc with the U.S., says Michelle Egan, a global fellow at the Wilson Center. Egan says Brexit also comes at a time when the U.S. is trying keep a check on Russian aggression. Western sanctions against Russia over its incursion into Ukraine are starting to wobble as some EU members want a return to more normal relations with Russia. The U.S. may find it more difficult to keep the sanctions in place without the U.K. in the EU. "The U.S. and the U.K. have been really, really resolute on sanctions towards Russia because of Ukraine," she says, "and now there may be sort of a less significant partner." But Matthias Matthijs, a political economist at the Johns Hopkins School of Advanced International Studies, says the U.S. had already been gravitating toward Germany long before the Brexit vote. Matthijs says the Germans have been taking the lead in a number of recent crises. "We've had the euro [currency] crisis where Germany was at the wheel, the crisis over Ukraine with Russia, Germany diplomacy was at the heart of this ... and then the refugee crisis, the fallout of the Syria conflict, again, here you've seen Germany take the lead," he says. The relationship between Washington and Berlin took a hit in 2013 when Germany discovered the U.S. had been eavesdropping on Chancellor Angela Merkel and several of her ministers. But relations now are rock-solid, says German ambassador to the U.S. Peter Wittig. "We have extraordinarily close relations on a government-to-government level; there's very little daylight in all the major issues that we are facing," he says. The relationship will intensify as "the management of that Brexit is unfolding," Wittig says. While the U.K. may lose its special status as a bridge to the European Union, it will continue to play a lead role when it comes to intelligence, Matthijs says. "The intelligence cooperation between MI6 and the CIA is very close, internally as well between FBI and MI5," he says. "And these are links that have been established since World War II and are ongoing. I mean they're very, very, very close relations, very close cooperators." Matthijs says Britain's departure from the EU may even help strengthen NATO, because the U.K. may want to show it's still very much part of the Western alliance — even if the special relationship with the U.S. fades. But the U.K. is expected to take a sharp economic hit for leaving the EU, and questions remain about how it will be able to afford to beef up its military.